My father-in-law's name was Valentine but everyone called him Val for short. I wonder if he was ever teased as a child for having such a unique name. And I wonder if he knew that his name came from the Latin word Valentinus, derived from Valens, which means "strong and healthy". Most of us go though life without ever giving much consideration to our beating hearts, until one day we wake up with clogged arteries and need a triple by-pass. But by eating a whole foods, plant-based diet, I know that I'm doing everything I can to diminish the possibility of getting heart disease later in life. But that doesn't mean that on Valentine's Day I won't enjoy a glass of red wine, or a eat piece of dark chocolate because both contain flavonoids, which are considered to be "heart healthy". 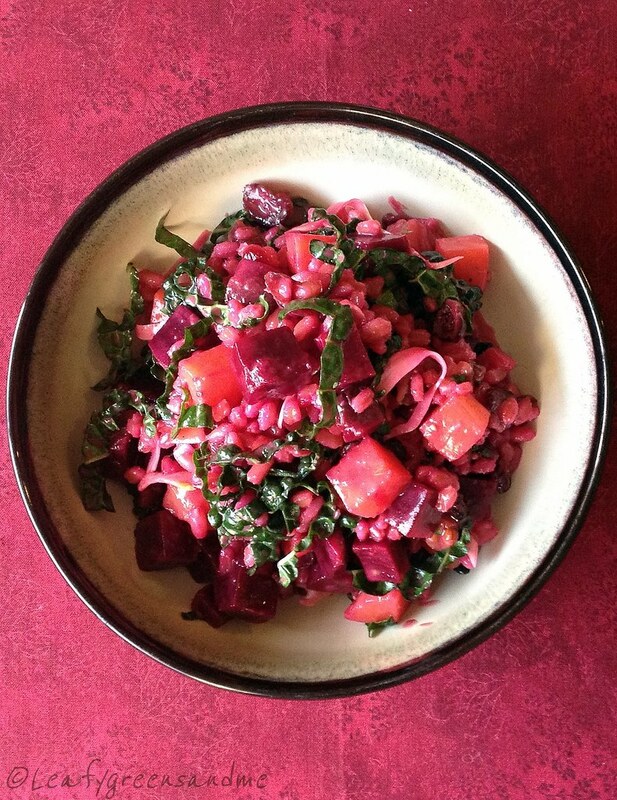 But to balance it out, I'll definitely make sure to eat a healthy salad like my Roasted Beet, Farro & Kale Salad and go for a brisk walk. Remember, Valentine's Day isn't just for that special person in your life--it's also for you and your "heart" and keeping it "strong and healthy"! Add sherry, orange juice, mustard, garlic and chipotle to a blender and blend on high until combined. Slowly drizzle in olive oil until emulsified and then blend in maple syrup and salt and pepper to taste. Pour over salad to moisten--you may have extra vinaigrette left over. I have neighbors - an elderly couple. Husband's name - Valentine wife - Valentina. In Russia, this name is not popular, but it occurs.